Hah! I already worked this one out, actiually. Florian Viktor aged to about twentyish years old- and *stayed* that way for quite some time. And would have stayed that way indefinitely- had he not met Dr. Io. Being a Mad biologist, he decided that he would spare the most important person in his life the fate of aging slowly, while Florian stayed the same. He artificially induced aging in himself- albeit mostly cosmetically, and as he saw fit. It should be noted that Io *did* agree to allow any further aging on his own part to be halted, and now he and Florian will remain the way they are now indefinitely. Also, it's fully within their combined powers as geneticists to reverse their own aging should the need ever arise. But as the patriarchs of such a large family, they feel more comfortable looking a little more grandfatherly. Ooh, good answer! And I thought I'd stumped you. Of course, I've painted myself into a corner...I've already said Farnsworth looks a very fit forty. Which would make him...pretty darn old. At the time, it was before retrofitting. The V twins were apparantly 30-ish,Viktor had a streak of gray, we didn't know there were no such things as part jaegers. I could backtrack, but I've got a mental image of Farnsworth in my mind, and it would seem weird to suddenly declare him younger looking. Not necessarily- he was made differently that Florian, who was made differently than any of his descendants. Alpha through Eta all just grow at a slowed rate- a rate that gets exponentially slower as they approach maturity, I should add. Just assume that the difference is due to being administered brau- if it let him age at *all*, then it must have worked somewhat like the Tinker rate of aging. Alpha and Beta look about thirty-ish, while in fact being about fifty. So it's not inconceivable that Farnsworth is more like 60ish. Its not actually sentient, nor is it related to the pink. Its actually just a form of caramel that was very difficult to clean out of test tubes, because the multi-layered "gobstopper effect" causes the water to collect in a pure form at the center, then dissolve a path out in the direction of gravity, leaving rock candy. Wonka was at the time developing a version of the Cadbury egg creme, and when this substance was added to the empty core, it caused as second gobstopper effect that turned the mass into a springy whole, easily extracted from the glassware. Thanks to the gobstopper formula, the mass had too many conflicting flavors to be chewed upon, and peeling or sucking the mass triggered a third or umpenteeth gobstopper effect so that one never enjoyed more than the outer flavor. The active gobstopper effect made the curiosity interesting as a toy, but Mr. Wonka is not in the toy business. The gobstopper effect proceeds from the core outward, causing sugars bonded to artificial flavor molecules to align themselves in a single sphere of indeterminate size. The fatty molecules of the creme form a cross layer network so that when the core, now something of a marshmallow, is deformed, it the deformation is repeated on the outer layers in an expanding ripple effect. Stretching the marshmallow, combined with some momentum, causes the stretching across the room, but the outer layers become less stable and stickier while they try to change form. Squeeszing the marshmallow has the reverse effect, causing the layers to become less sticky. However, the reason Johnathan's sample appears "splochy" is because some of the outer mass has dripped off without being reformed by the gobstopper effect. There's usually enough left to act as an adhesive during heroic activity. It should be noted that the outer mass is torn away from the core, it often hardens into something like the capture goop used by some security personnel. This can be done accidentally, or intentionally in the case of making an equivalent rip in the core. Or, as always, all of this can be thrown out if its for something cool! Hmm... you know, I keep meaning to detail all the weapons and enhancements my various characters have taken to carrying around, but I didn't get around to it. Oh well, here we go. One large, seven-foot long, Final Fantasy style sword, capable of splitting into three separate swords. Strength and Agility enhancements: Enough strength to bring him up to the level of Jager, since that seems to be the standard for super strength in this world. Agility improved his reaction time above human norm, but not quite into superhuman. Forcefield: Bumps up Wally's toughness quite a bit, although it doesn't entirely protect him. Lasers, bullets, and the like are fully deflected, while sharp objects are stopped by the field. However, the impact is still felt, although it is diminished and distributed somewhat. Recently modified to add force to punches, and be able to be projected away from the body. Third Arm: The newly installed biochemical missiles are short ranged, and can be loaded with explosives, or various chemicals to be dispersed upon a hit. Robotic retinas: Allows him to see outside the normal spectrum, though that's usually off, because it makes his head feel itchy. One battery, hooked up to a cold fusion reactor, supplies the power. Flying wings/jets: Easily deployed and hidden, these allow her to travel much faster and with more agility. Refueling isn't a problem very often, because each jet generates it's own power using a small amount of antimatter. Laser eyes: They can shoot lasers. Oh, and it doesn't interfere with normal sight, because the actual barrel comes out near the tear duct. Missile bays: Located under the wings, these hold a selection of twenty four mini-missiles, which can be equipped with antimatter warheads, if overkill is called for. Tail gun/Paw turrets: Three machine guns, each with it's own bullet creation center. Forcefield: Similar to Wally's, but built to be more powerful and allow less harm through. Strength enhancements: The only Grey Flemish Giant able to bench press a ton. The main problem Lagos runs into is getting into a proper position to bring her strength to bear. Plus, she'd much prefer to shoot a problem rather than punch it. I'll detail War more later, but he's basically got more weapons systems than you'd know what to do with, and the usual ten foot tall robot abilities. Plus, he can be worn as a suit of armor. Unfortunately, he's about at the limits of his current power source, which means that if any upgrading is to be done, then research will have to be done into new forms of it. David Toboz: As a semi-experienced good guy and wannabe hero, David has had a lot of experience fighting by now, even if he is still pretty naive about the ways of the world. He could probably go toe to toe with Frederic without much risk at this point, at least until he got tired. (The fact that Frederic is pretty invincible means that David couldn't really hope to win by ordinary "beat on them until they fall unconscious" means, but he could hold Frederic off if necessary, probably.) His Wallycaine-built Robot Arm possesses superhuman strength, and David is beginning to learn that it also possesses an energy attack of sorts that, if he mastered, could be quite useful. David himself is also fairly strong, for an ordinary human, and it's implied that he's been able to fight on the same level as ordinary jaeger before, although the exact details are still unclear. Being a human, David has all the typical weaknesses humans have, but mitigating that seems to have a remarkable sort of luck, a trait common in heroes of the "unlikely" category. He is also Mad, like most of the cast, but aside from repairing almost anything he rarely is able to enjoy any of the benefits of that condition. Weaponry: The Arm, the Polarion Resequencer he still has from way back when, and a frequently changing list of batman-esque gadgets he uses to fight against evil wherever it lounges. Michael: Probably more dangerous than David, the only reason he's listed below him in terms of dangerosity is because he is rarely directly involved in the events around Xyon City, and therefore plays a much less significant role. Michael controls the 8 Zobot Masters, as well as some of the leftover Robotic Arm drones from Tanglebox (It has yet to be established what happened to the horde of Arm Drones, and if David were smarter he might have thought of commandeering one and using it as his replacement. But he didn't.) Michael is highly dangerous because he possesses the sum collective knowledge of 7 Mad Scientists, counting himself. This allows him a remarkable flexibility in his creations, as he has a number of different perspectives. He's best described as a Generalist in the field of Mad Science, possessing abilities in different fields that don't exceed a true specialist but capable of greater flexibility and diversity than said specialist. He has also been known to use shrink rays, anti-matter grenades, lasers of varying destructive ability, and some manner of magi-technology weaponry that he has yet to perfect. Richard Toboz: If it weren't for the Madness, Richard Toboz would probably be more dangerous than his younger brother. He's a trained surgeon with a large amount of knowledge of the human anatomy, as well as an experienced Martial Artist who periodically studies different fighting styles in order to expand his repertoire. Richard's philosophy, which is at least partially motivated by his competitive streak, is one of continually self-improvement and practice. He works very, very hard to become the best at whatever goal he pursues, and he's not used to falling short. To this end he carries a bit of a pet peeve about anyone who carries the Madness gene, as from his point of view they essentially are given great power without having done anything to really deserve it. (This has been a subject of tension between himself and his Fiancee in the past, although they have both come to a fragile understanding.) Richard cares for his brother very much, but at the same time he would like it very much to prove that he's better in every way than him. To this end he will continue to chase after perfection of mind and body until he either drops dead or attains it. Weaponry: Knowledge and experience in 5 different martial arts. Considerable strength, constitution, and dexterity to back it up. On top of that, his training as a surgeon gives him a considerable knowledge of human anatomy, from pressure points to organ positions. Richard is also very knowledgeable about a number of other medical and scientific fields. Elleb: A pretty young fairy, Elleb is just barely able to maintain basic Glamours, and doesn't have a large reserve of magic to dip into. She's capable of many different sorts of smaller magics (particularly mental or transformation ones) but isn't quite powerful enough to use them often without tiring herself out. Weaponry: Mild-mind affecting and transformation magic. Small ability for evocation. The ability to glamour herself. Physically very weak, mentally childlike. Sarcastic: She's essentially a regular, run-of-the-mill human college student. Sarcastic has a bit of fighting training and experience, but the fact that she hasn't been training for most/all of her life puts her at a disadvantage against people who can create deathbots and world-destroying bombs. Still, she's got something rare in this world: common sense. Weaponry: Sarcastic's greatest weapons aren't her fists, but rather the twin mundane talents of common sense and resourcefulness. She is also pretty good at roleplaying, and can improvise that into a passable acting ability when she needs to lie or trick people. Between the abilities of his Madness, and his natural Resilience and Strength, Andrew is quite the powerhouse. Although, he isn't particularly fast in combat, despite his light size. Which is mitigated by the fact that he prefers, when possible, alternate avenues of action. Of course, since those alternate avenues are talking, debating, manipulating, lying, trickery, and cunning this may not be comforting. Weapons: Personal skill with fighting dirty, a smattering of curious inventions, a robotic hand adapted to turn into a Hook, and The Menagerie/The Grues. Oh, and Sayasuke. And, I suppose, Thaddeus Guy. While he may not share the brute strength and stamina of other characters, he makes up for it with speed, skill, and training on roughly the same level as Richard Toboz. Although he is mostly a 'combat pragmatist' (he uses what works), he does in fact study some Tai Shing Pek Kwar (Monkey Kung Fu) due to it's incorporation of the Staff, and the pragmatism of the move set. If pressed, he is an expert with most conventional firearms. All of wich should be taken into account with his preference for non lethal fighting. Weapons: Staff (capable of lengthening and becoming heavyer), 1 gun of indeterminate origin and make, and the resources of M (if applicable). Fredric, Sayasuke, etc- another day, as the Cold Monster is trying to eat me. Claire: I've been asked to detail my main fears here. Because the writer finds it funny and it's come up a few times. And- wait, why am I going along with this again? Because I have your teddy bear. And I want everyone to get *your* impressions of these things. Claire: Right. *grumbles* OK, number one, as you may have guessed, is Kirby and other marshmallows. I *hate* marshmallows, and Kirby ate me and it was really awful and I don't want to think about it any more. Claire: Number two is the Care Bears. *shudders* I'm not talking about this one any more. Number three! Radiant. He's scary, and could probably kill me and my entire family without repercussion, and if anyone retaliates the rest of the 10 Gentlemen come down on them. Claire: Number five- therapists. Because after I spend too much time with them, I tend to think that I've hallucinated most of my life, and then I start having nightmares, and usually at some point they decide to lock me up in a mental institute and take away my explosives. *shudders again* Fortunately, I gave Jennifer's name. And, for the record, I can now get out of a straitjacket. Claire: Those are the main ones, anyway- I guess they're more like phobias, because they're irrational- I still have all the normal ones about my explosives being taken away and never getting to see my friends again and that sort of thing. *to the writer* OK, I did it. Now give me back my teddy bear! I was just thinking about writing another Interview, when I realized something! What exactly does Dixie De'ville look like? I don't think anyone's ever fleshed out our favorite unfortunate reporter. Everyone, post your ideas of what you think the 4th most intrepid reporter in the Mad Sci continuity here, please! And once we decide, I'll add some physical details into my next interview! For some reason I picture blond curly hair-at least shoulder length, maybe longer. No glasses. Uh, that's all I've got. I think of her having a very 'femme fatalle' look, with dark red lipstick and nail polish. Okay-this one's for Fredric. Believes firmly in Science, but has magic powers. A brief paraphrasing from L. Sprague deCamp and Fletcher Pratt, The Mathematics of Magic. Two psycologists who've worked out a formula for magic/diminsion travelling are discussing/refining it. "The class alpha plus the class non-alpha includes the universe. But it may or may not be limited thereto. The reason seems to be that in magic one deals with a plurality of universes. Magis thus does not violate the law of the conservation of energy. It operates along the interuniversal vectors, perpendicular, in a sense, to the spatial and temporal dimensions. It can draw on the energy of another universe for its effects. Evidently, one may readily have the case of two magicians, each summoning energy from some univere external to the given one, for diametrically opposite purposes." 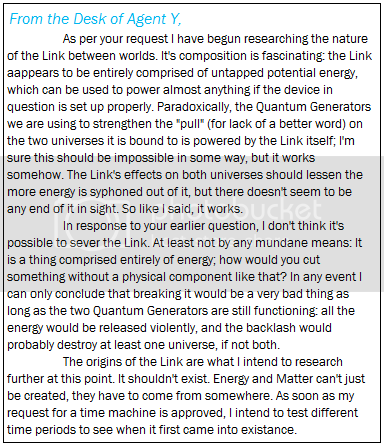 There's a lot more technobabble, but I thought Fredric would appreciate the conservation of energy bit. Okay, I'm double posting-sorry! Just had a thought, Give Dixie platinum blonde hair-she'd be like a 50's/60's femme fatale. I just saw a production of Singin' in the Rain, and the Lena Lamont character just popped into my brain as a prototype for Dixie. But without the terrible accent. I always pictiured Dixie as Megan Mullaly at her most glamorous- especially when she played Karen Walker in Will and Grace. First of all, don't ask me why he isn't 'Viktor'- I haven't worked it out yet. In my head*, I decided that a unique detail of the Posi-Nega verse is the separation of Alpah-Beta from Gamma-Delta and Epsilon- aside from Universe 1p and 1n, this event usually never happens. Mostly because I actually find it sad they never got to grow up together- that Viktor and Io diddn't get to raise their children, that A+B never got to be the tough, protective big brothers... and that, most of all, Eric only got to be a part of their lives for such a short amount of time. Because as sad as it is, Eric's death *is* a constant in a healthy percentage of universes- every single universe where his sacrifice was necessary, he went through with it. By the way, In universes where there was no need, there was no 'Father', and Xerox was adopted by his parents as a baby. He grew up with Claire from the start, has very few scars, and went mad naturally at around 16 or so. He still ends up in the same role more or less, and is still weirdly grumpy and cynical, but arrives there without the weight of a thousand crimes, or the haunted remorse of a soldier. These are happier universes, as you can imagine. But I am very attached to the name 'Tinker'. It's always 'The Tinker Project', I suppose... let's say it's an alias that just always seems to stick. Useful when you don;t want to be Viktor- as these things go, it carried a rather weighty rep with it. First of all, he's clearly more insane- I like hinting that Andrew really is insane. Only he exists in a 'Mad' universe, so it's hard to really notice.Fantasy Andrew exemplifies this, although admittedly he is far worse off than our Andrew is- blame the Fantasy world lack of readily available child psychiatrists. His personality is inherently the same.. A lying, morbid, Science minded man with no 'common' sense... and a warm, loving, sentimental, fiercely loyal protective man, all at once. Only Fantasy is much more fractured- the darkness is a little darker, it's buried a little instead of , and he can only really pull into focus when someone else depends on him. Interestingly, this is the reverse of regular Andrew. He's slowly stopped 'switching' selves as part of his character development, he no longer hides his wicked traits coughDavid'sinfluencecough. And he only 'falls apart' in moments of stress when no one is directly depending on him, like when he destroyed his hand. Interestingly, Andrew's duality of charcter is a relic from wayyyy back when he was first conceived. He was Andrew Tinker, and Thomas Ericson. This Tinker was pure, unrepentant psycho evil, with gentlemanly, affably cruel air. Thomas was kind, and fatherly, but spineless and clumsy. Originally, Thomas was actually this Andrew's hapless lab servant. Eventually I realized that I was writing two halves of the same character, and there you have it. Interestingly, Thomas Ericson's legacy lives on- I had already been toying around with a blond version of him that became Eric, and from there... well, the rest of his family is mostly variations on the same two character archetypes, just tweaked and tilted and filtered. Which just males Andrew's duality more natural- it's an inherent part of his family. Light attracted to darkness, darkness attracted to light, over and over again- so Andrew is naturally, both in one person. I realized recently this is also from the disappearance of Eric- he no longer had him as his father figure, and Ethan Entropy stepped in through his teenage years in honor of his friend. This Fredric has never had to take care of his father in quite the same way. He's a little less brash, and his 'curse' has sapped a lot of his independent spirit. There's no such thing as New Wave/Romantic Glamor Punks in Fantasy, so instead he;s a Scottish Warrior brave sort. He's more easy going than Fredric, and not as bothered by his bizarre new powers. And most obviously, he has a Scottish accent. Neat, Tinker! I love reading about this stuff... it's been a real treat to read the stuff the others posted about their characters in the Mad Alchemy OOC section as well. It's really fascinating. And thank you for getting so into it. Incidentally, while it's not hard to tell, people even a year or two younger than I might not recognize that the game I'm running, Tales From Interpol, is actually somewhat inspired from an old NES game named Maniac Mansion, which inandofitself was a console port of a commadore 64 game. Since I grew up on the tail end of the NES console's lifespan, people even one generation younger than me probably didn't have the opportunity to play this game, and that makes me a little sad. Maniac Mansion was one of the first Adventure games I ever played, so it is somewhat near and dear to my heart as being one of the things that stoked my love of the genre. But it's also pretty heavily inspired by the sequel, a game known as Day of the Tentacle, another game created by two really talented guys named Tim Schafer and Dave Grossman, the former of which also created Psychonauts, which I know at least Tinker is familiar with, if not other people as well. Regrettably, it's rather hard to play Day of the Tentacle anymore, which also makes me a bit sad, given how quirky and funny and crazy it is. Day of the Tentacle has a really funny plot, filled with old-school mad science, time travel, and "The Fly" references. The main characters are Bernard, the wimpy, scrawny nerd who was also a protagonist in Maniac Mansion, Hoagie, an overweight and rather strong rock and roll enthusiast and drummer for a band, and Lavurne, a girl who is just sorta... weeeird. For those that are interested, there's a youtube compilation of a playthrough of the game that can be found here. I recommend checking it out if you ever have 2 hours to burn and a fondness for laughing. Thanks for listening, if you've read this far. This was really just an excuse to wax nostalgic, but I hope people enjoyed it. Alright, this post is to explain Herr Doktor's unique talent. He has the ability to split into 24 separate, functioning Herr Doktors. Each of these Doktors were created when the thread of reality was altered in the lab while he was in the machine. He does not serve as a portal, but more of a box. At this point things will become a bit technobabbly, but not much. The atomic structure, DNA and etc. of all of the other Herr Doktors are stored in his body and mind. As stated by physics, there is a lot of empty space in any substance, even a solid, Herr Doktor has no empty space, and actually has so much packed into him that his DNA is becoming jumbled. This occurs when he separates, because he uses the genetic and atomic material of the other Herr Doktors as a carrier for his, so every time he separates he loses distinction between him and the others. He uses a small amount of his own mind and subconscious to control the duplicates, so his mind is jumbled with the thoughts of the other Herr Doktors, all trapped. If he were to take a hit from a disentegrator blast, or any quantum-blast weaponry, He would probably split into the Duplicates themselves, who were duplicated, and still exist in their home dimension. This version of Herr Doktor is the positive dimension's personality, which overwrote the negative dimension's personality, so the negative dimension is lacking a Herr Doktor, and positive dimension has two, but they should not meet at any point. * Cough *. Any questions, feel free to ask them in the pester thread. A few notes on Ann, the Sarah-ish girl that David encountered, since I'm not sure we're gonna get into it in the main game. Ann, also known as Mockery, is specifically a clone of Sarah Toboz from the negative universe. Although it has yet to be clearly explained how Sarah died in both universe, it's implied by the high opinions of her brothers in both universes that she was a truly Good person in both. Specifically, she was that rare sort of person who put the needs of others before herself, was unfailingly nice, kind and polite, and never wanted anything more than to see the others around her happy. Sarah died at a young age. Two notes I created and PMed to people a while ago... 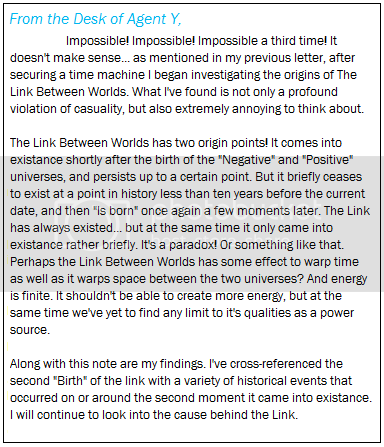 They're mostly just to describe background information about my chapter, "Energy and Potential" and the Link Between Worlds, which is a major MacGuffin in that chapter. Ok, at the request of Chic and Zobot, I present- the Umbra Family tree! Got inspired, so here's a small piece about what fantasy Jane and pirate Jane carry in the order of weapons and useful devices. a sword, mainly for defense. a knife, primarily for eating, though it is sharp. a pistol, when necessary/appropriate. It's been modified to fire bullets or lightning, depending on the situation. a great number of other knives, secreted in PQJ's clothing where she can reach them. Incidentally, the cord around her neck does not hold a locket, religious emblem, or voodoo trinket like you might expect: it's another knife. a knife, primarily for defense. Not much to be said. It's short, and made of steel. a few other knives, most of which are poisoned/otherwise drugged. They look identical to her main one. a tiny, golden token, which Jane usually wears around her neck. It looks like any old piece of golden jewelry; in reality, though, it makes it so that Jane's magical abilities can't be detected. Extremely rare, extremely valuable, and extremely useful. a worn, leather pack, with a great number of hidden traps. Woe to the curious intruder who goes rummaging around inside! a coil of spiderwire (inside the pack). A semi-magical wire that's practically impossible to see, and can't be cut or broken unless you know how. Jane uses it for tripwires, and other things. Reusable. various magical and alchemical supplies (pack). Not much to say, really. hollow jewelry (pack), for when/if Jane needs to dress up. More cunningly constructed than the old 'remove-stone-and-pour' model, these devices can do their work in plain sight. Mostly rings, but there is a bracelet or two. various potions and similar (pack), creations of Jane's alchemistic art. other useful items (pack), covering everything from useful magical trinkets to dice to food. Mostly mundane items. It goes without saying that Jane is an expert at palming, handling, and using the pins... and many an unsuspecting person still hasn't figured out what hit him. Armor. OK, this one needs some clarification. While both Janes' outfits look like ordinary traveling gear, the outfits are a lot tougher than they look and can turn away all manner of damage. This goes for most other outfits either Jane has had made for her. And now you know. Fear the sneakiness of Jane Narbon! What follows is an essay on my characters. Not because of anything in particular, just because I felt like doing it right now, and it's helpful to flesh out characters if you take the time to seriously examine them. Feel free to read it if you want some insight into my weird mind, or just ignore it. I've been thinking about two of my secondary characters lately. Specifically, Sarcastic and Michael. And I felt like examining their characters in a bit more depth. Sarcastic was originally added as a parody of sorts to the "Gamer Girl" Stereotype you see in webcomics a lot, but I quickly dropped that. The character rebelled against it for some reason. Now she's... well, I want to do more with the character eventually. I think in a later chapter she has potential to step into more of a substanial, main character-ish role while David takes a step out of the limelight. Not that I don't like David, or that I don't have future plans for him... just that a LARGE amount of his personal conflicts have been resolved by now. He's struggled with his fear of Jane Narbon (Hero's Quest) and with his issues with Sarah Toboz (Energy and Potential), not to mention the greater issue of Zobot's Legacy and his family's connections with each other. (Again, Energy and Potential). He no longer has an evil, scheming Robot Arm plotting against him, and his relationship with Andrew Tinker is getting warmer. His greatest problems were his inexperience and naivete, and while he's still kinda dense and naive at times, he's come through many challenges stronger for them and proven himself a seasoned fighter with experience, as well as a staunch and upright person. He may not be the hero he always wants to be, but he tries. While David still has some issues to work out, a large amount of his future conflicts are likely going to be external ones... such as with Dave Olsen, whom he's EVENTUALLY going to meet. Sarcastic, though... whoo boy. We've seen signs that she doesn't quite have as much self confidence as she acts like she has (See the end of "Dangerous Minds" and her meeting with Radiant. See also Act 2 of "Energy and Potential" when she's having a personal break down and Khan is only able to calm her down by getting herself to roleplay a character of hers that seemed to be a stronger person.) She also has trouble believing in other people, although that hasn't been AS apparent in-game yet. Sarcastic acts tougher than she is, but if you push her beyond all her growling she starts to crumble a bit like a wet paper airplane. Sarcastic revisits the "Only Human" issue that I originally planned to explore with Richard Toboz (although that dream ended when I decided to make him and Drezebel a couple for no adequately explained reason)... she's a man among gods, figuratively speaking. She's pushed her way into a world that she doesn't really belong in, a world of weird science and mystical powers and monumental struggles of good verses evil. She did this mostly because she's also the sort of person who, deep down, dreams of living an exciting life. A friend of mine called the condition "Adventurelust". She's the sort of person who, in a more mundane world, might have spent her time playing in a play-by-post game about Mad Scientists. (A bit of snarky metacommentary there.) Sarcastic is a stark reminder that the majority of the world still IS normal, the parts of it we don't typically see fit to write about. And yet at the same time her few unusual traits, such as her Clark Kent syndrome, have more often than not been an inconvenience to her rather than a benefit, especially in a game where most of the cast has a work around for being able to ignore it. Getting Tinker to let her keep the Portable-Seige-weapon crossbow is a rare blessing for the character, because even if it DOES dislocate her shoulder when she fires it (Curse mundane physics and the principle of kickback!) it's still useful for intimidation value. Sarcastic has also shown signs of not being as good as she'd like to be. (Such as stealing from that one mugger when she was with Claire in Project Bluelight.) I've hinted that she has a bit of a less than stellar past... specifically, she was a bit of a wild girl in her late high-school years, ending up in Juvie for a year before settling down and getting a bit less bad. She joined up with David to get the same sort of thrills, just on the other end of the moral spectrum, and hopefully to balance out her karma a little bit. Plus, Michael was paying her to keep an eye on him for a bit. One of the things I don't really think I'm satisfied with is that I haven't really been able to convey yet is that Sarcastic has STARTED believing in David, and to a lesser extent, in Thaddeus. She doesn't like trusting people, and she's a bit scared of this. I keep worrying that people would misinterpret it as her being attracted to David, which it really isn't. (Sarcastic: It'd be like dating a sibling!) Through her association with David she's starting, tenuously, to believe in other people, and even to believe in herself a little bit (which explains why she wasn't a sobbing heap during Dangerous Minds and Energy and Potential when she started getting into REALLY dangerous situations... in Dangerous Minds she had plenty of people backing her up and she couldn't let herself get scared in front of them, and in Energy and Potential she was lucky to have Khan be there when he was, or else she WOULD have broken down, big time.) Sarcastic, to some extent, considers herself not as significant or important as the Mad members of the cast... there's a perceived Class dynamic there, with Mad Scientists being a weird sort of nobility in comparison to the rest of the world (Which I find Ironic given how most Mads consider themselves social misfits and outcasts) and while Sarcastic might not be wholly aware of it, she really doesn't consider herself as equal to them. This is exactly the sort of behavior that Richard Toboz would get really, REALLY angry about. Sarcastic is the sort of character I'd like to see grow. Sooner or later David's going to fade into a bit more of a background character for a little while and Sarcastic is going to be thrust into the limelight, whether she likes it or not. She's going to be challenged in a way that none of the Mad characters in the cast would be able to deal with, and she'll either succeed gloriously in a way that'll bring a tear to your eyes and make you smile in joy, or she's going to fail tragically, in which case I'd turn the situation over to the rest of the cast to try and pull a happy ending out of a sad one. I'd like to see Sarcastic either grow into a strong figure who, somehow, has found a way to make the rest of the cast tremble, or I'd like to see her take on more of a literary tragic heroic role, with all the ominious circumstances that that entails. Sadly, the latter option is more likely than the former. Still, this is far off in the future, because I can't honestly think of a situation where Sarcastic could succeed where the rest of the cast would fail. It's a bit of a stumping thing, and I need to think about it more. Michael is another character I feel has potential to take a center stage role in the future, admittedly for different reasons. Michael's not like Sarcastic... he's got perhaps too much self confidence, and a bit of a snotty attitude to match. He's not as nice as Sarcastic is, although they both are more snarky than David would ever be. Michael's biggest internal struggles are with establishing his own identity, and knowing what he really wants. He's obviously attracted to Jennifer but he doesn't know how to properly express it, and he has trouble being nice to people. In some ways he wants to be a villian but in other circumstances he'd rather be a hero, and he has yet to really choose. And at the same time, Michael has concerns about his own mental stability, and they appear to be somewhat valid. I could go on, but I don't want to give anything away. Anyway, If you've read this far, thank you for listening to my rumblings. I like doing stuff like this, and it's always nice to see people paying attention to it when they do. If you skipped over most of it, well, I encourage you to go back and at least skim through, but it's your choice either way. Chief Cuthbert 'String Bean' Dean- He got his name due to being tall and skinny. He's *always* called String Bean, even by his officers when on the job. He doesn't go after Mads much, figuring that's M's job, but Claire, at least, isn't Mad... He pretty much lives on aspirin and antacids. I think he's in some way related to Mayor Dean as well. Officer Charles Arancio- He's the expert on strange (usually Mad) -related things. He transferred in a couple of years ago. He's also completely terrified of the color orange, for reasons that haven't yet been explained. Officer Polymer- 'He' is basically a sentient plastic who generally has a humanoid form. Beyond that, he's pretty normal. Actually, *very* normal. When not on duty, he generally reads, watches television, or hangs out with some friends. On duty, he's a slightly above average officer, although the fact that being shot doesn't really hurt him is useful in Xyon. Officer William 'Willy' Wilkerson- He's generally considered to be the best officer on the police force, mostly because he's brave enough to stare down a Mad- most of the time, anyway. He's also pretty good at knowing what's going to explode, or turn into a potato, or attempt to tear someone's head off. When asked how, he said "If I'm wondering about it, the answer is probably yes." Officer Chester Karpov- She's rather pugnacious, and fluent in both English and Russian. Hates Borsch, and will completely flatten anyone who says she isn't feminine. Officer Krupke- He transferred out a while back. It was right after he tried to stop Rolf from 'kidnapping' Eta... and found his cruiser in a tree the next day. Okay, also from the pages of Chat! I liked this idea enough to want to keep it. The calendar idea from earlier started something. Every year, since about 1943 or so, the jaegers have put out an annual cheesecake calendar. Two different ones, even though there's 500-1000 males, and what, maybe a couple dozen females, tops? The money helps pay the gigantic beer bill at Mama Gkitkas. Chic will probably get leaned on to participate. Helga: About time! There's only so many ways we can make this different, after so many years. Ingrid: You said it. Those feathers last year gave me a rash. If you must know, the Boys of the Black Hat Brigade were June of 1963, and Rolf got October of 1967. I don't know about the Viktors. There's many a beauty shop, spa, ect. with a pinup calendar in the back. I like to think after seeing what the Betty Grable pinup did for morale in WWII, Mama Gkitka did one of her own...but that's for Tinker to decide. I found an Ooooooold list of short story ideas I had for Mad Sci High back in the day, and I decided for fun to type them up. I dunno why, maybe someone can get some inspiration from them. Anyways, I hope you enjoy! Episode 1: The Pilot Episode: David meets a girl named Ellen, who he takes on a tour of the school. They end up in the basement levels, fighting a giant spider. David gets detention for skipping class the whole day. Episode 2: Nikola Tesla takes over the school: David unleashes a sealed away severed zombie head of Nikola Tesla, who takes over the role of Principal in the school due to being surprisingly popular, and Chic strong arming many students as his campaign manager. But when Principal Xerox gets frozen in carbonite and Nikola Tesla starts plotting to build the school into a giant Tesla coil that would kill off the school, David realizes he must intervene. Chic declares her eternal emnity against him for this. Episode 3: So It's Come To This: Clara discovers that her experiment has accidentally created a race of tiny little people. Hilarity ensues. Episode 4: The Last Great Prank War: Dana Amino and her arch-rival Ingrid get into a prank war which threatens to engulf the entire school. Only the unlikely alliance of Principal Xerox and Maria Narbon may be able to stop it. Episode 5: Moments of our Lives: 3 short stories centered around the Toboz family. Richard Toboz goes out with a Punk Rock Groupie named Killer Kathy while she's passing through town, David saves a transfer student named Andy from a bunch of bullies (who he had already cowed and scared to death before David showed up, not that the hero fanboy knows this) and Sarah tries to fix a damaged clockwork sparrow she found in a tree outside. Episode 6: The music teacher tries to badger Ellen into singing in the choir, even though she promised her parents she never would sing in public. This ends in a riot. Episode 7: Ultimate of Fighter! : All the kids are getting into the new Mad Monster Creation game, PokeMads. Clara gets abducted by her cousin, who attempts to train her to become the greatest Pokemad ever. The introduction of Mike and Ginny! Episode 8: Politiks: Jane and Maria Narbon run against each other for school President. Nothing good can come of this!!! Episode 9: That Romance Stuff Again: David and Andy go off on their first date, causing Ellen to feel neglected and alone. She decides to go off on her own for an amazing adventure of some sort. Episode 10: The Wacky Time Travel Adventure: Andy and Chic travel to various parts of the school's past, present, and future, and find a creepy future where an evil version of David is taking over the world. Episode 11: Children: An episode about Mike, Ginny, and baby Frederic. No cohesive plot had been written yet. Episode 12: Season finale. The evil Nurse unleashes her plot to take over the school, and use it to take over the world. She kidnaps and brainwashes Jane Narbon, and a number of students have been abusing her pills of pure evil. Now, in order to keep David from being her next victim, Andy, Chic, and Dana Amino must find a way get him out of her clutches before she convinces him to choose popularity over what's right. In the process of making nefarious yet stylish devices, Jane and Chic discovered a few tricks you can do with cloth. Two, to be specific. Discovered by Jane, metalcloth is a special cloth that can be custom woven on one of the machines in Jane's lair (Chic has a duplicate machine). Impossibly tiny micro-wire strands are wrapped around the fibers that make up the cloth, forming a network of conductive fibers. The finished product is unique in that it will conduct electricity. If ordinary wire is used, the resulting cloth will appear to shimmer under certain lightings. If the wire is tinted beforehand, it is undetectable. Both Jane and Chic have found uses for it... some uses scarier than others. In combination with inertial redirectors for safety and discreet force-field generators for areas of exposed skin, ArmorWeave has helped Jane and Chic stay safe in style. On the financial side of things, the duo have filed a patent on the process and are in negotiations with a number of manufacturing companies (mostly for military/covert applications). With the Help of Claire, I have came up with an immediate family tree for Miss Clay. Description: Jacob is a tall guy, about 6'4. He is business like in appearance even at home. (casual being a blue polo shirt tucked in and tan dickies) He has a black hair which he keeps combed. His facial expression would that being of no nonsense but still warm and loving. His body build is a little on the skinny side. No glasses. Description: Anna has what is called a pear body type. This means The hip measurement is greater than the bust measurement (like a pear). She is about 5'7. She has long flowy hair that sometimes gets in the way (loose strands in front typically). She does not have much time to keep bunched due to the kids. She typically wears a white t-shirt and jeans. She wears glasses when working on the computer but does not usually wear them around the house. Also her face is heart shaped. Her facial expression would that of a tired mother but a good kind of tired. Description: Frank likes to know everything he can. He keeps a small notepad and a small pencil with him at all times. He wears a deep red t-shirt that has a breast pocket. This is where he keeps his small notepad. His shirt isn't tucked in. He wears jeans also. He is about 6'0. He looks like the typical stringy teenager. His hair is brown and a bit messy. His facial expression is that of noseyness. Description: Moses looks like any 9 year old. He is about 4'0. Stripped t-shirt and loose fitting pants. He always have some toy with him and likes to get into everything. Description: You know like OMG! Marison tries to keep up to date on fashion, despite her parents attempt. She is about 5'6. She dyed her hair pink, have earrings and bracelets. She has a pink shirt with "Quaint Train" (a name of one of her favorite bands). She uses hair clips but does not put her hair into pony tails. She is skinny and does not have a lot of curves to her body. She would be chewing some gum while at it. Description: Beth is a quite girl. Standing about 4'8, she is fairly unimposing. Her hair is brown and in a single low pony tail. She likes to keep to herself a lot. She wears a baseball cap, an off white t-shirt and jeans. Her facial expression would that of a shy person. The clays are considered a lower middle class family. There is only one computer and that is reserved for Anna's work. Jacob works hard to provide for the family and tries to spend as much time as he can with the family. The Clays, although chaotic, is a loving family. The Clay's are also a religious family (hence the names). They believe strongly in family Morals and a strong family. The Clay's have many family traditions including family tag on Wednesday, Game night on Saturday and family karaoke on Monday (to dispel the Monday blues). Miss Clay (Or Urza Clay still to her family, despite protest) is the oldest in the family (at age of 24) and with the support of her family she is going to College to Learn Civil Engineering. The family helps with the tuition when possible but thanks to her new job as an assistant for Hawk, this extra little help is no longer needed. Miss Clay stays in touch with her family has much as she can (hence the demand of vacation time and such). This is a little difficult due to the fact that she lives over 600 miles from them. The family does not know who Dr. Hawk really is, or that he even has the Dr. title. Miss Clay Called him Mister hawk around her family. She was going to do this even before Dr. Hawk asked if she would keep his true identity from her family. As far as the family knows is that Mister Hawk runs a hardware store and Miss Clay is his assistant. Miss Clay feels guilty about lying to her family but sees it as necessary in order to keep confusion and possible misunderstanding from getting in the way. EDIT: Editing this in due to the shortness of it. Languages: The family as a whole speaks English, except for Beth who can't speak at all. She was born with useless Vocal cords and cannot make a noise from her throat. The family as a whole learned American sign language for Beth. It was not that it was because she could not hear also but because it is more polite at times to talk to Beth in sign language. Also many of The Clay family learned the usefulness of talking without making a noise, especially when trying not to be discovered by your parents when sneaking out with your older brother. Due to this fact, many secret sign languages developed. There is secso, one talk, brotherhood, Parent talk, Speed, Double-on, Girl talk and rev-latin. Secso is the language Miss clay and Beth use when wanting to talk about some sensitive matters. Since Both shared rooms up until Miss Clay moved out, both of them have became very close. Only these two know of secso and are continuously trying to find new words to add. One talk is a modified version of the standard sign language but with only one hand. While technically not a secret language, one talk does require some getting use to. Many of the motions used would be confusing to the average person. Frank, Miss Clay, Marison, Beth and Moses bothered to learn this. Brotherhood is the language of the guys in the family. No girls are allowed to learn it. The motions are full of macho and thus is easily identified as brotherhood. To keep the girls from picking up on it, brotherhood usually uses multiple motions to mean the same thing. Of course the girls usually just roll their eyes whenever they catch someone speaking in brotherhood and mumble about boys will be boys. Frank, Moses and Jacob knows it but Jacob does not usually use it. Parent talk is for the parents to talk amongst themselves so the children can't understand what they are saying. Typically when the children see them talking in parent talk, it either is about something they don't care about, like bills, or a disagreement. Only Jacob and Anna knows, although Frank is trying to pick up on it, without success so far. Speed is all about how fast you can get your point across. This means cutting corners and making your motions as fast as possible. The person would sometimes looks like his hands are having a seizure when going full speed in speed talk. Frank, Moses and Marison know speed well enough to use it. Too fast for the rest of the family to keep up or bother learning. Double-on is more of a fun secret language. It is having two conversations at once. Not only does it require hand motions but also vocal. Whatever you say at the time changes what your hands say. So if you say out loud "I am going to the store today" but say with your hands "I am going to defeat you" then what you are actually saying is. "I will race you to the nearest store." This requires a lot of attention to pull off in not only in speaking it but also picking it up. Moses, Marison, Moses and Frank knows how to speak in double-on. Girl Talk is similar to brotherhood except for the females in the family. Typically this is used when girls want to talk about, well girls stuff. Just like brotherhood is for guys talking about guys stuff. Anna, Miss Clay, Marison and Beth knows this. Rev-Latin is actually based on Pig Latin, but in reverse. instead of placing the first letter at the end and adding "ay" at the end, you take the last letter and stick at the beginning along with "ya." So "the" becomes "Yaeth." not that hard to pick up on once you recognize the pattern. This is used mostly either being silly or having fun. Everybody in the family knows this. Last edited by Hawkwolf on Sat Mar 20, 2010 5:45 pm, edited 10 times in total. Otherspace is a secondary dimension-space overlaid over our own. No matter can survive there, but otherspace's substructure naturally stores and processes information. Unlike our multiverse, which has three spatial dimensions and one temporal dimension, otherspace has two informatiotemporal dimensions, which track information content and information flow, and three spatial dimensions, allowing information to be kept in a sort of infinite grid. Mapping one/three-dimensional realspace to two/three-dimensional otherspace is quite new, and most forms of otherspace technology are in the development stage. Using more advanced techniques, properly processed pockets of otherspace can also be used for backup (due to the temporal nature of the information content dimension) and even the transformation of multiple pockets of information, leading to the generation of objects otherwise impossible to create. Ever since she was in a number of sticky situations (the Wolf Pit in the Frankenstein Grand Prix, frozen at the Mad Scientist Awards) with little/no recourse, Jane Narbon has taken a number of steps to make sure she is never defenseless again. Chief among these (aside from modifying her clothes so that various small, innocuous features [e.g. buttons, zippers, bootlaces, etc] can be easily crafted into a variety of weapons and devices), she has begun research into otherspace technology. Currently, Jane has achieved opening accesses to otherspace, and has used it as transportation for various hazardous lab substances that previously tended to eat through cables on a regular basis. Right now, she's working on creating accesses that are self-sustained and can be embedded in objects, and/or worn on the body, for quick'n'devious inventory storage... and other, yet more nefarious applications. (Un? )fortunately, it looks like it'll be a while before she, or anyone else, masters the secrets of this parallel dimension. Welcome to what I call "Secondary Character Spotlight"
For those who are interested, this is mostly going to be me talking about some of the multiple characters I've introduced into the game that I haven't really had a chance to do much with, either intentionally or just because of time constraints. The reason for this is that these characters really are more complex in my head than they seem to come off on paper, and while I don't really always have a good time to do much with them, I'd love to explore them in more depth somehow. The characters themselves have also graciously consented to give their opinions during this thing. The first character I would like to discuss is Sahara. As most people have figured out by now, Sahara is a large apex predator, specifically, Panthera leo, a member of the West African variety of the species. If you're wondering how, being a lion, she's able to talk, this game really isn't suited to you. Sahara is a character that is, lamentably, not gotten a chance to shine in Mad Sci Wars. As a tertiary character, we've only ever really seen her thus far in relation to her boyfriend, Khan, so we haven't gotten much of a chance to see much of her beyond the context of that relationship. Even worse yet, what we do see is fairly unflattering... Sahara is excessively violent towards, suspicious, and jealous of other females near Khan, and has purportedly tried to kill him several times, culminating in her Red Sign Item-driven rampage on her college campus where Khan broke up with her and she broke 43 bones in his body. Sahara: *Covering her eyes with her paws in shame* I wasn't thinking clearly, ok? I didn't mean to lose my temper! Expanding on the dynamic of that relationship a bit makes the behavior a bit more understandable, if still unacceptable. Lions are, by their predatory nature, an aggressive species, and giving one sentience is a pretty good way to make an already dangerous creature even more unstable. Sahara is fairly clingy, while Khan, since tigers are by nature a more solitary species, is a bit more aloof, and occasionally this causes Sahara to lose her temper. It's never a wise idea to make a lion angry, and it's rarely a wise idea to make your significant other angry, so when Sahara's instincts and her annoyance begin to work in tandem, she has a tendency to overreact. Violently. Khan, in all honesty, would probably be the same way if riled up enough, but he has a tendency to take things more in stride than Sahara does. Sahara: My sweetie's gonna be a modern philosopher or something! Sahara is largely a character inspired by my experiences in high school and early college. A lot of younger adults, of both genders, seem to be possessed with the bizarre impression that they HAVE to be romantically involved with someone, or else they're somehow "broken" in some way. No one ever said it like that, of course, but it seemed to be implied. I saw people, especially in college, willing to throw themselves at people even THEY realized weren't romantically comparable with them. This culminated in the experiences of a friend of mine, who out of respect I will not name... she was so desperate for romantic affection that she was willing to relocate her entire life and leave behind all her friends and family just to move across the entire country, spending most of her savings in the process, just to be with a guy she had met a few months ago at a trade convention. When the relationship didn't work out, she even TRIED to kill herself... While I understand how fun dating can be, and how wonderful it is to share your life with someone, I will say that when you obsess over the idea of being with someone to the point of defining yourself in your relation to them, then you've got a screw loose. Sahara has, unfortunately, bought into the notion that if she's not with someone, there's something wrong with her. This has made her somewhat clingy and slightly obsessive. Regardless, let's move onto some of the more flattering aspects of Sahara's character. Some people might not know this, but Sahara has superpowers. Specifically, she can run at incredibly fast speeds, has an incredible reaction time, and is both resilient and much, MUCH stronger than your average lioness. What might actually surprise people is that Mad Science had nothing to do with this. As far as anyone knows (Including Sahara) she was born in a normal litter of lion cubs, the only one of her family to be much, MUCH more intelligent and physically gifted. An early encounter with biologists in Africa caused her to learn the rudiments of English, which astounded these biologists when they found she could speak. Medical science has studied Sahara's physical and genetic makeup and discovered no apparent cause for her odd abilities at all. She doesn't seem to have any mutant genes, nor does she seem to have been injected with any mysterious chemicals or anything like that. As far as tests are concerned, she SHOULD just be a completely ordinary lioness. Yet she's blatantly not. Several Mad Scientists have tried to study Sahara over the years, with equal levels of success. Shocking enough, when faced with something that they couldn't seem to understand, these Mad Scientists seem to have ended up driven almost SANE by the experience. The process is fairly predictable: Each one started out confident that in a few days they'd have a rational explanation for what causes her to be different, followed by a few days of study and inconclusive results. This leads to two to four weeks of obsessed, desperate, single-minded research, finally leading to a break-down period that results in a burnt down, sane, relatively tame individual. Oh, they'll still experiment on a monkey now and then, but for the most part they spend most of their free time reading through newspapers and drinking tea with some scones. Her abilities are blatantly non-magical, apparently non-scientific, and blatantly fly in the face of any attempt to understand them. Sahara: They made the funniest faces whenever they used to ask for more blood samples! Outside of her relationship with Khan, what little I've shown of Sahara is a that she seems very effiminate. She's a predator, certainly, but the fact that she kills to eat on a regular basis is a very unimportant detail in her life, something equilivant in significance to putting gas in your car. It's something that needs to be done, but not something life-defining. Sahara likes watching dramatic movies and soap operas, and she went to college to be closer to Khan, since he was going to college. She's studying biology, with a minor in philosophy, and gets intermediate grades (a B to C average) in most of her classes. She also wears clothing that she orders custom made from a specialist tailor. I imagine in a world where lots of oddly-shapen sentient artifacts of Mad Science are running around, there's at least ONE clothing artisan who makes a healthy living out of on-request clothing. As for the outfits themselves, they're usually based on popular ladies clothing, but scaled and designed for her anatomy. Imagine a cat wearing a pet sweater. Now imagine the cat and the pet sweater, magnified to look huge. That's about what Sahara looks like in her outfits, although if you point that out it usually results in growling and biting and pain. She also enjoys getting someone to paint her claws for her, and although she lacks a mane (being female) she likes dying the fur around her head on occasion, in a manner similar to how a human would dye their hair. Currently she's dyed those sections of fur a bright red, which she's very satisfied with. Sahara: I look so hot! Sahara is a character taken from an old series of short stories I wrote a while ago, "The Phoenix", about a titular main character who is, surprisingly, absolutely nothing like Jean Gray. The story she was introduced in "Why should homo sapian get all the fun?" dealt primarily with super-powered animals. Khan wasn't in this series, so the Sahara in the short stories was very much more of a character not defined by her relationship. I hope, in the future, to draw off of this story a bit more in the future when writing for her character... in it we see a similar Sahara to the one we've already met, but with one specific twist: she makes a hobby of singing. She's actually pretty good at it, and she enjoys doing it. This hobby actually started out when she was a cub... the biologists she met at a young age weren't the most scrupulous of people, and ended up abducting her and taking her across Europe, having her sing for money as a curiosity... she eventually made them pay for it after she'd decided that she had enough of "show business", but the whole experience instilled in her a love of singing that has never gone away. Thanks for reading about one of my stranger side characters, and I hope you've enjoyed it! A small broadcasting company that broadcasts shows, news, and music for the new age. Started up by two young entrepreneurs by the name of Mike Nickleson and Geoff Jackson in 1992, New Age Radio have featured shows like Nearly Home, The Killer Next Door, Racer Boxcar Johnson and Detective Mysteries. Recently New Age Radio have secured rights to air the show Another Day At The Lab. For a list of shows during the week, We have provided you with our daily calender. Davison Porter: One of the field reporters, seems to be obvious to dangers in many cases. Used a lot to cover disasters and fights. Johnathon Cork: One of the voice actors for the Radio Play Crew, noted for doing the voice for Another Day at the Lab. Mark Barber: One of the voice actors for the Radio Play Crew, noted for his role in Space Ace. Vickie Washington: One of the voice actors for the Radio Play Crew, Noted for her role in Killer Next Door. Last edited by Hawkwolf on Thu Jan 07, 2010 5:19 pm, edited 2 times in total.